Henry Thompson has dedicated his life to improving America's infrastructure as a proud employee of the United States Municipal Survey. So when the agency comes under attack, he dutifully accepts his unexpected mission to visit Metropolis looking for answers. But his plans to investigate quietly, quickly, and carefully are interrupted by his new partner: a day-drinking know-it-all named OWEN, who also turns out to be the projected embodiment of the agency's supercomputer. Soon, Henry and OWEN are fighting to save not only their own lives and those of the city's millions of inhabitants, but also the soul of Metropolis. 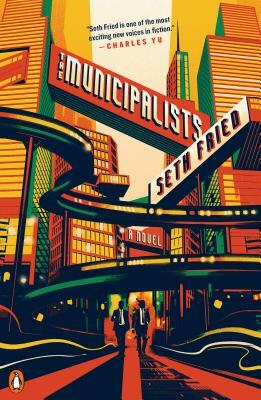 The Municipalists is a thrilling, funny, and touching adventure story, a tour-de-force of imagination that trenchantly explores our relationships to the cities around us and the technologies guiding us into the future. Seth Fried is the author of the acclaimed short story collection The Great Frustration. He is a recurring contributor to The New Yorker's "Shouts and Murmurs" and NPR's "Selected Shorts," and his stories have appeared in Tin House, One Story, McSweeney's Quarterly Concern, The Kenyon Review, Vice, and elsewhere. He is also the winner of two Pushcart Prizes and the William Peden Prize. "Even if you’ve never spent one day in a city, but are just someone who wants to laugh and marvel at Fried’s imagination and wit, this book is also for you. Really, it’s for everyone. "—NYLON, "50 Novels You'll Want to Read in 2019"
“Seth Fried is a pure delight to read. "—Karen Russell, author of Swamplandia!